Due to the popularity of our listing of North American Wine Trails & Regions, we've decided to expand this topic by enlisting the help of regional experts to describe the wine trails in their local. 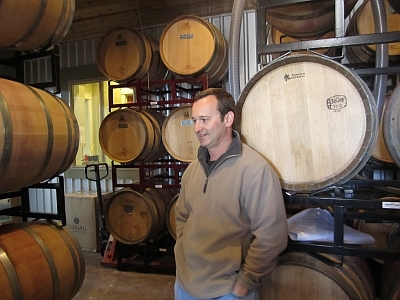 Our first guest writer is Jeff Cope, the Texas Wine Lover, who recently traveled the Thirsty Oaks Wine Trail. We were invited to spend the weekend at the winery The Vineyard at Florence by our friends Mike and Carol. We gladly accepted the offer and we all tried to determine what other wineries were nearby. After looking at the map, I thought why not look to see what wine trails The Vineyard at Florence was on and it turned out to be the Thirsty Oaks Wine Trail. 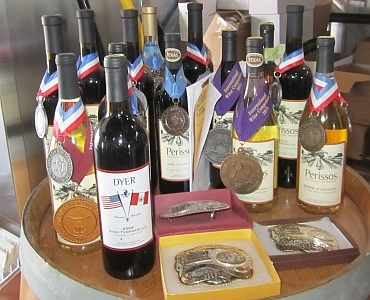 The wine trail includes four wineries: The Vineyard at Florence, Inwood Estates Vineyards, Perissos Vineyard and Winery, and Pilot Knob Vineyard. That turned out to be our scheduled plan. Since we would be staying at The Vineyard at Florence villas, we decided to start at the furthest winery which was Perissos Vineyards. Since Mike and Carol would be staying until Monday and we had to leave on Sunday, we met at Perissos when it opened. Owner/winemaker Seth Martin soon greeted us and gave us a tour of the winery starting at the estate vineyard. We had enjoyed a previous vineyard tour with Seth when they were giving free tours last year so we remembered most of what he told Mike and Carol, but with just the way Seth shows his enthusiasm about growing grapes, it is always enjoyable listening to him. He explained how they are adding another three acres of vines in April which will include Petite Sirah and Malbec. Seth described how he developed his own trellis system for the vines so everything is done at eye level instead of being lower which requires bending over or higher which eventually hurts your shoulders. Another thing Seth does differently than most other wineries is determining when to pick the grapes. Instead of relying on brix, pH, or acid to decide when to pick, he lets his tasting of the grapes determine it. He explained after the brix level is reached, the flavor of the grapes come through at that point, and that is when he prefers to pick just before they eventually would turn into raisins. We then headed back into the winery to do a tasting of the wines. During the tasting, we were fortunate to do a tasting of the 2012 Viognier which would be bottled in three days. Again we were very lucky to have a vertical tasting of Perissos Tempranillos. These included the 2009 Tempranillo which is a blend of 50% Tempranillo and 50% Touriga Nacional, 2010 which is 80% Tempranillo and 20% Touriga Nacional, and the 2011 which is 90% Tempranillo and 10% Touriga Nacional. The overall favorite from the group was the 2011 which had the higher percentage of Tempranillo. To finish reading about the trip, visit Road Trip to the Thirsty Oaks Wine Trail.